A composite number is a positive integer that can be formed by multiplying two smaller positive integers. Equivalently, it is a positive integer that has at least one divisor other than 1 and itself. Every positive integer is composite, prime, or the unit 1, so the composite numbers are exactly the numbers that are not prime and not a unit. For example, the integer 14 is a composite number because it is the product of the two smaller integers 2 × 7. Likewise, the integers 2 and 3 are not composite numbers because each of them can only be divided by one and itself. Every composite number can be written as the product of two or more (not necessarily distinct) primes. For example, the composite number 299 can be written as 13 × 23, and the composite number 360 can be written as 23 × 32 × 5; furthermore, this representation is unique up to the order of the factors. This fact is called the fundamental theorem of arithmetic. There are several known primality tests that can determine whether a number is prime or composite, without necessarily revealing the factorization of a composite input. For example, 72 = 23 × 32, all the prime factors are repeated, so 72 is a powerful number. 42 = 2 × 3 × 7, none of the prime factors are repeated, so 42 is squarefree.
. A number n that has more divisors than any x < n is a highly composite number (though the first two such numbers are 1 and 2). 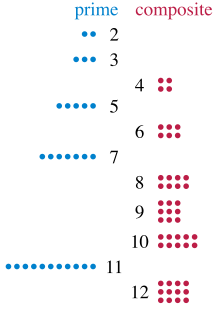 Composite numbers have also been called "rectangular numbers", but that name can also refer to the pronic numbers, numbers that are the product of two consecutive integers. Yet another way to classify composite numbers is to determine whether all prime factors are either all below or all above some fixed (prime) number. Such numbers are called smooth numbers and rough numbers, respectively.